To view frequently asked questions about this product visit www.e-deliverygroup.com/faq There are no returns or refunds on electronically fulfilled PIN numbers.Walmart.com is not responsible for stolen or misplaced PINs. *Pins are usually delivered in minutes or, at most, within 48 hours depending on additional order validation required by Wal-Mart or your Credit Card company. You will receive a confirmation email from Walmart.com within minutes of successful order placement. A second email from walmartonline@e-deliverygroup.com with access to your PIN will be delivered within 60 minutes* If you have issues receiving your email, go to the following webpage to access your purchase: www.walmart.e-deliverygroup.com. Enter your email address used to order on Walmart.com, your billing ZIP code and your Walmart.com Order Number (your order number can be found on your confirmation email from Walmart.com or in your Account Order History on Walmart.com). 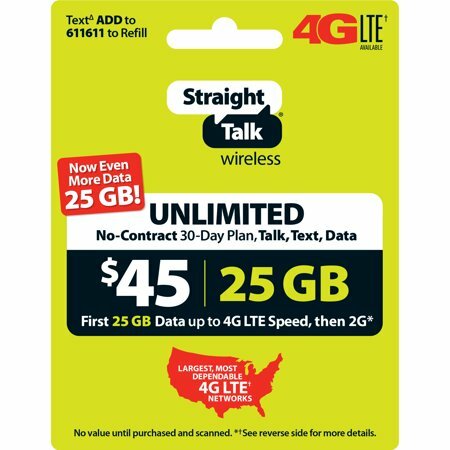 Straight Talk's $45 Unlimited 30-Day Plan includes unlimited talk, text, and data with the first 25GB of data at up to 4G LTE† speeds, then 2G*. Nationwide coverage on America's largest, most dependable 4G LTE† networks. * At 2G speeds, the functionality of some data applications such as streaming video or audio may be affected. Please refer always to the latest Terms and Conditions of Service at StraightTalk.com. READ THIS BEFORE YOU BUY!!! I have two Straight Talk phones. When everything works, it works WELL, but if there is a problem, it could potentially take days and days to have it resolved. The problem is that all of the Straight Talk representatives are in Guatemala. If you need answers to common questions such as "when does my service date end?" they have no problems answering you. But if you are having problems that they do not have a routine answer for, the language difference becomes a barrier. For the price you pay, it is definitely worth being patient with them. Here is what I strongly recommend: 1. When you first activate your phone, DO NOT register your credit card online (e.g. for automatic refill) UNTIL you have completely activated your phone and you are sure that it is working. Then go back and log in to give your credit card info. 2. If you are transferring an old phone number from a different carrier, be sure you have the correct account number (different from the cell number). This process takes a couple of days, so again, do not give credit card info until the activation is complete. Just use the air cards you buy from Walmart. I HIGHLY recommend Straight Talk. Just understand that there is a language difference and IF you need to speak with them for something "out of the ordinary" you will need plenty of patience. Just think about the money you are saving! Love IT! COuld not be better! Love saving MOney! At first I was not sure about this product. We have been with tmobile for over 6 years. But paying 222.00 a month for our phones got to be to expensive. So we canceled our contract and got 2 straight talk phones! I love them! They are nice and inexpensive! Actually I have never had to pay for a phone. If you visit their website, they offer free phones when you buy a monthly plan. Either 1000 mins or the unlimited! Also it is nice to pay as you go or on their website you can set up autorfill or reserve mins for your next month! Also it is simple again on their website to upgrade your phone and still keep your same number! You can also keep your previous number from another phone company, even landlines! So you can not go wrong here! We went from paying 222.00 a month for 2 phones to paying 75.00 a month for 2 phones! I use the unlimited plan becasue I also use it as a home phone! I get unlimited talk, text and web! My husband uses the 1000 mins plan and it works great for him because he is not on the phone nearly as much as I am! And the best part is you can upgrade or downgrade your plans whenever you want! WITH NO CONTRACT!!! Okay, I have the E71 phone and I am VERY HAPPY. I pull 3.5 G in most areas. This service is the same service that ATT wanted $100.00 for with my BlackBerry (BB). This phone is BETTER than the BB and the service is EXCEPTIONAL. I use my phone everywhere. Now if you want to call internationally you can't do it with this service BUT you can sign up for Pingo.com. I call Vietnam for $0.04 per minute with Pingo. Stop paying Verizon, ATT, Sprint money for NOTHING!!! This service is GREAT!!!!!! it's better than the $100+ a month phone bill. I priced this both on Straight Talk's website and Walmart's website, and the taxes were about 50% cheaper on Walmart's site. Straight Talk hits you with the E991 tax and 2 or 3 other governmental cost recovery "taxes" that you do not need to pay if you buy through Walmart. This is also better than buying in the store since you don't need to deal with scratching off the coating over the codes which I found rather tedious. If not careful, you can scratch off the code itself which, from what I understand, is difficult to get resolved.